Engineering excellence meets athletic excellence: Beginning with the start of the new 2017/2018 sports season and continuing for a period of three years, Siemens will be an official "Performance Partner" for FC Bayern Munich and FC Bayern Basketball. With forward-looking solutions and digital products, Siemens will not only be supporting FC Bayern Munich in the area of sports, but also in the area of technology. As part of this partnership, the use of Siemens technology is to be further increased – for example at the Allianz Arena and the Audi Dome, in administrative buildings and at the training facilities on Säbener Street in Munich. 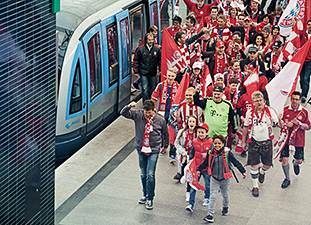 In addition, software- und cloud-based services for FC Bayern Munich in the areas of power engineering, building technology and safety-and-security technology, intelligent mobility solutions for local public transportation and traffic management systems play a key role in the cooperation agreement. In this way, Siemens will be bringing to play its full range of expertise and innovative power for FC Bayern and its fans along the entire value chain of electrification, automation and digitalization. The new season of the Bundesliga, Germany's national soccer league, marks the start of a three-year partnership between Siemens Healthineers and the renowned championship team FC Bayern Munich. From July 1, 2017 to June 30, 2020, the separately managed healthcare business of Siemens AG will be an official partner of the German record champion, serving as its official medical solution partner. Siemens will become an official "Performance Partner" for the FC Bayern Munich soccer and basketball teams at the start of the new sports season. The partnership will begin on July 1, 2017, and continue until June 30, 2020. FC Bayern Munich's Allianz Arena and Audi Dome are already equipped with a large number of Siemens solutions.